If you want to enhance your intuitive and telepathic powers then Ulexite is your stone. The chemical structure of this stone is sodium calcium borate and it has a hardness of 2.5. The triclinic crystal structure is either colorless or white. Calcium is a mineral element of mica found in mineral makeup. 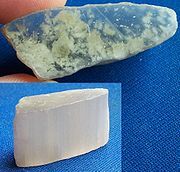 Ulexite is generally found in evaporate basins and the southwest desert of America. It’s also known as the TV stone as the colorless slices have a property which is akin to fiber optics. If you place a slice of ulexite above a page then the page’s image will be seen on the surface akin to a TV image. The element of this stone is wind and it works on the third eye chakra. It corresponds to the zodiac Gemini and vibrates to the number 33 and 8. This stone can help you to sort out your emotions and bring things in perspective. It can aid in accurate dream and vision interpretation. It aids in bringing forth a resolution from the deepest core of the problem there by proving that in every problem lies its solution. It aids in helping you to choose your path on the spiritual level. This stone is perfect for knowing the true feelings of others and helps in accepting them with compassion. This stone aids in understanding the aura or the consciousness field around a person and aids people in understanding the true intentions and feelings of others. More often than not this will be relayed as a hunch about the person and with Ulexite around that hunch will be right! Many people use Ulexite to enhance their mental powers and get answers to complex problems. It also aids in learning many complex subjects like foreign languages, science and mathematics. Students who use Ulexite are able to understand concepts faster and even have enhanced memory. This stone also works in combination with other stones like Celestite, Angelite, Selenite and helps in connecting with the higher realms. When used with Moldavite it enhances the intuitive abilities. Past, future or present, Ulexite is a perfect stone for knowing events. It can even be used to facilitate contact with the celestial beings like fairies, gnomes and nature beings. Physically this stone can aid in improving eyesight and correcting double vision or removing eye fatigue. It also aids in wrinkle removal when you bath in its crystal remedy. People whose jobs involve imagination and creativity will do well with this stone! It is a great stimulant for imagination and creativity and helps in unleashing the images stored deep within the subconscious mind. Hence it aids in discovering new concepts and inventions that are waiting to be discovered deep within the recesses of the subconscious. People who wish to enhance their telepathic powers can use ulexite in this simple exercise. This works best with a partner. Once you find a partner, each of you can keep a piece of Ulexite on your third eye and then try sending and receiving images and thoughts by writing whatever one receives on a piece of paper. Ulexite is more like a mental or psychic walkie talkie which can even be used to communicate with your loved ones.